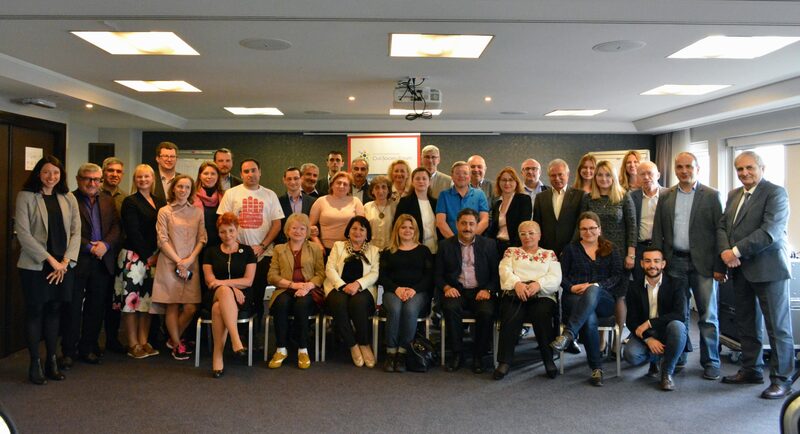 On 15-16 May, a joint meeting of the Working Group 2 “Economic Integration & Convergence with EU Policies” and Working Group 5 “Social & Labour Policies and Social Dialogue” was held in Brussels. 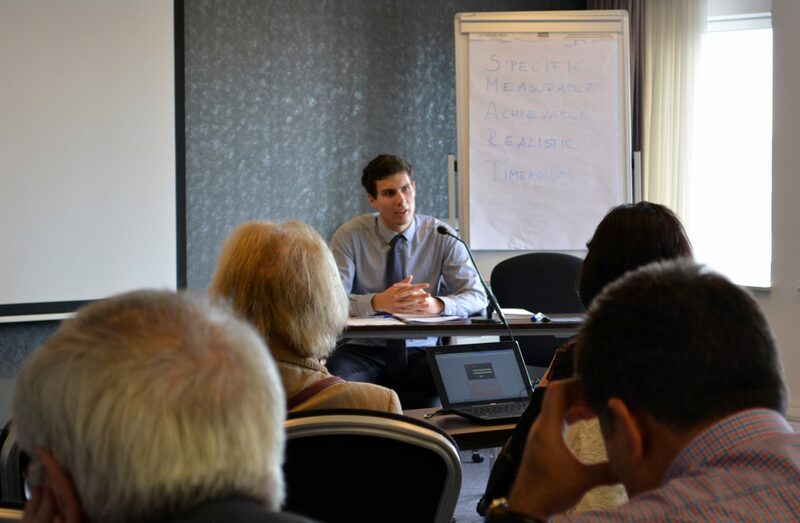 The multilateral EaP Platforms and Panels were presented to the members as unique opportunities to participate in the deliberations between the EaP governments, EU officials and Member States, and showcase civil society expertise. The need for further alignment of the Forum’s bodies with the revised structure was also explained. In order to ensure further transparency, the pool of the EaP CSF representatives at the EaP Platforms and Panels as well as the comprehensive calendar, combining the upcoming official meetings and events is now public and accessible to both the National Platforms and Working Groups. The members concerns on re-granting procedures and improving communication with the National Platforms were addressed by the Secretariat and Steering Committee members. The 2018-2020 communications strategy, including the visibility of the EaP CSF participation in the EaP Platforms and Panels, and the visibility guidelines for re-granting projects and National Platforms were presented. 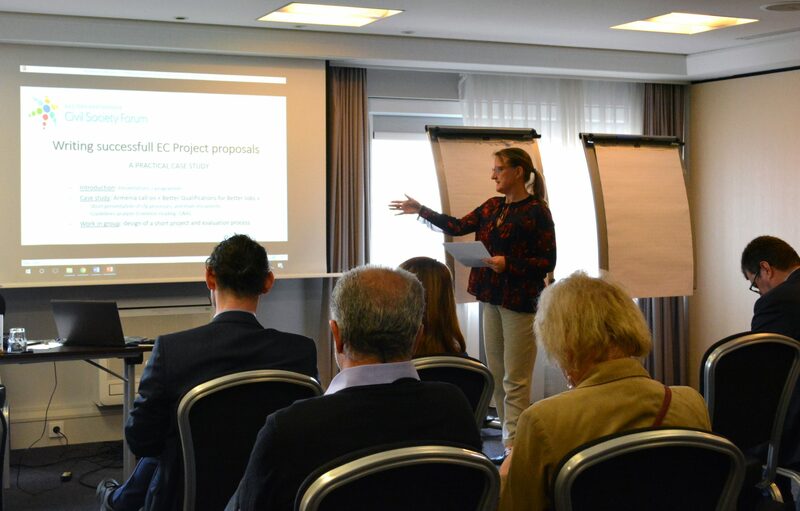 In line with the capacity building strategy and the new format for the WG meetings the civil society representatives followed trainings on successful tailored messaging, the EU decision-making process, and writing successful project proposals. The stakeholder meetings were focused on delivering the messages to Maxime Bablon representing DG Internal Market, Industry, Entrepreneurship and SMEs (DG GROW) and Frédérique Rychener from DG Employment (DG EMPL). In the meeting with DG GROW the members called on the EU to promote the harmonisation of the classification criteria defining SMEs. There is also a need for the EU assistance in improving the business climate for SMEs, including the bankruptcy provisions. The meeting with DG EMPL focused on improving working conditions and education standards in the EaP countries. In the context of the planned EaP Youth Conference in Vienna in November, the youth unemployment group came up with joint solutions for improving the working conditions in the EaP countries, especially those for young people, addressing the brain drain, creating decent jobs and developing a coherent legal framework in the EaP countries and through bilateral EU-EaP agreements. In the framework of the upcoming Informal Ministerial on Digital Economy in Minsk in June, the members of the Harmonisation of Digital Markets group developed concrete recommendations on improving the governance and coordination by elaborating the HDM policies, developing action plans, and creating national roadmaps. Having in mind the EU-Armenia CEPA and the civil society role in monitoring its implementation, the members from AA/DCFTA signatory states shared with their Armenian colleagues major issues and best practices in the successful implementation of the Association Agenda. When focusing on business climate and SMEs, members developed recommendations on further support on approximation of the SMEs legislation. They shared best practices on key issues such as promoting women in business and innovation, and asked for more technical cooperation to build capacities on transparency when managing the EU grants. During the meeting, the EaP CSF Working Group 5 worked on a statement on returning to the previous level the representation of the EaP participants in WG5, and changing the date of the 10th Assembly (Russian version).